Knowing that the Smithsonian Libraries had a more bountiful number of holdings for the two titles than other collections across the country, she approached us. Recognizing both the needs of the Sioux Community and the research community at large, the Library staff began pondering how to pursue the project. The first request of its kind for digitizing Native American newspapers, it took the staff a bit of sorting through potential twists and turns, but the relevance of the project’s importance was at the forefront. 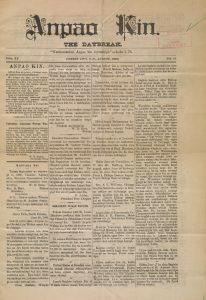 These historical Sioux newspapers will now be much more accessible with far less need for the print copies housed in the Anthropology Library to be handled, except on rare occasions. Published in North Dakota and South Dakota, respectively, The Herald of the Black Robe’s Church (Sina Sapa Wocekiye Taeyanpaha) and The Daybreak (Anpao) are being included in the Smithsonian Libraries’ Cultural Heritage Library. 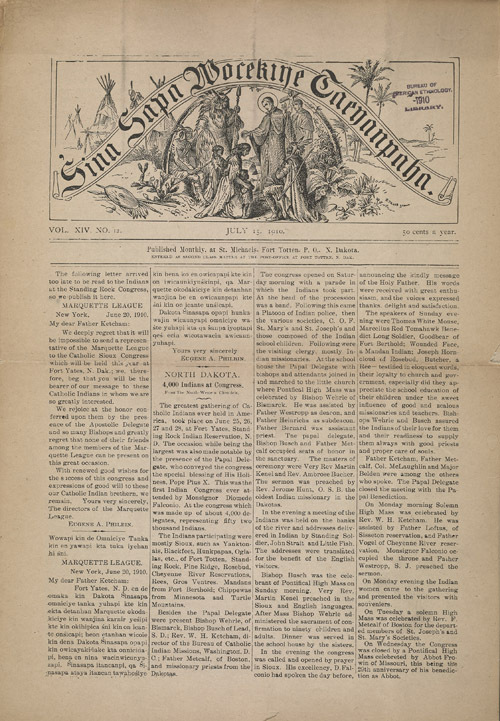 Around one third of the Library’s holdings of 160+ issues of Sina Sapa are now in the Internet Archive. Because of serious conservation concerns, The Anpao issues, numbering almost 300 in the Libraries’ holdings, will be digitized later. A lengthy course of events occurred prior to scanning the material. After library staff from three units collated the issues and reviewed conservation concerns, months elapsed. An experienced cataloger met the next set of challenges, carefully and masterfully teasing out additional newspaper titles embedded in the groupings of holdings. Examining each issue, he mentioned enjoying the correction and enhancement of the existing catalog records. 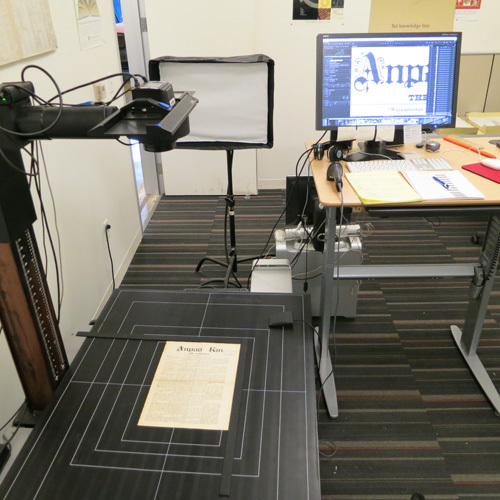 Once the Libraries received a long-awaited large-format digital scanner, staff began digitizing the newspapers. Sina sapa wocekiye taeyanpaha (The Herald of the Black Robe’s Church), 1892-1939. Saint Paul’s Catholic Indian Mission of the Yankton Tribe of the Sioux Indians). Fort Totten, North Dakota. 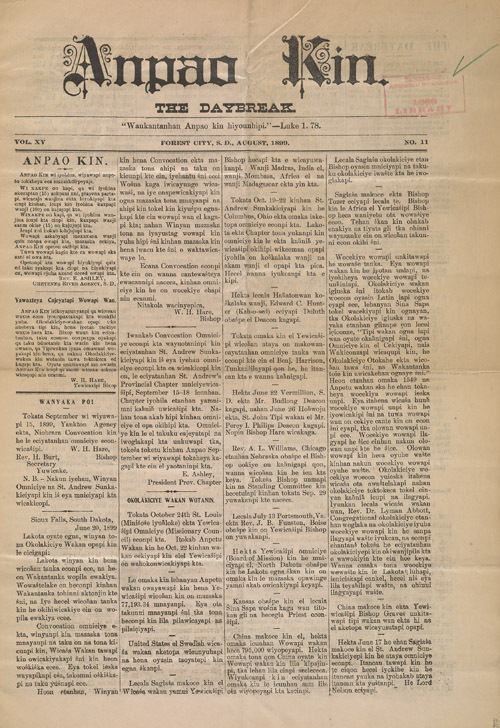 “The monthly supplement “Eyanpaha” was occasionally included. The earliest presses of tribal newspapers were started by missionaries. The papers and magazines were designed to demonstrate the religious activities of the missionaries, including teachings and educational practices they engaged in with the tribal villagers. Researchers can find nuggets of biographical information about individual tribes’ people; invaluable leads to Native American ancestry, linguistics and tribal dialectical examples. 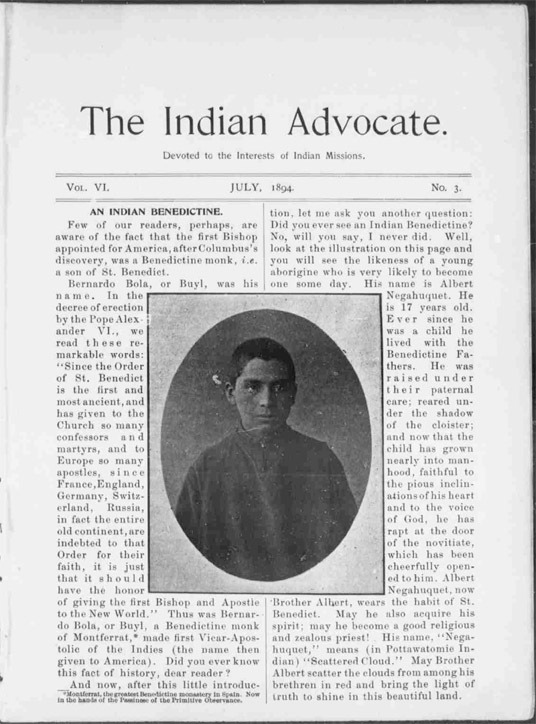 The Indian Advocate, courtesy of the Library of Congress. These new digital titles will add to the small but growing number of historical Native American newspapers on the web. When searching, one can find some by name, but there are not many websites or portals for full text tribal newspapers. 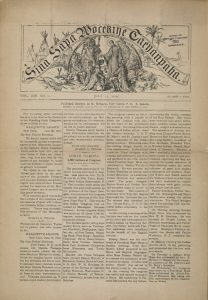 Fortunately, The Library of Congress’ project Chronicling America: Historic American Newspapers has digitized, with funding from the National Endowment for the Humanities, a number of tribal newspapers including those of the Cherokee, Choctaw, Cree, Creek, Mohawk, Navajo, Northwest Alaskan Inupiat, and Yupik, among many other states’ newspapers. 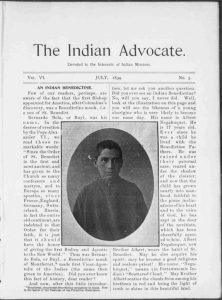 One of the first documented tribal papers was published by the Benedictine Fathers of Sacred Heart Mission in Sacred Heart, Oklahoma, and called The Indian Advocate, text in English and Choctaw. It began in 1889 and ceased publication in 1910. Previous Post Smithsonian Libraries Presents…Joel Richard! this is awesome! the Lakota oyate should revive the newpaper in their Native tongue. I’m interested in accessing Sinasapa Wocekine Taeyanpaha online. When will it be ready?